At a time when Durban theatre is at a low ebb, Spotlight Productions are to be congratulated for putting on a musical production with a live band of four and a cast of six singers making up a ten-member company. The production is titled Girl Power and pays tribute to the attributes of powerful women. It is a good ensemble piece and runs for two more performances at the comfortable Musketeers venue at the German Club in Westville. The stage easily accommodates the production but lighting does need improvement. A follow spot would also be a worthwhile investment for Spotlight Productions. This would take the show to a higher level. 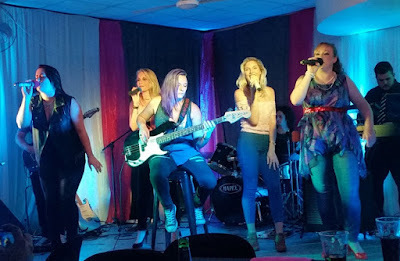 Girl Power offers loads of energy, commitment and wholehearted message about female power with all the songs requiring power and intensity. Gentlemen need not feel passed over as this isn’t a feminist approach to the subject but rather a celebration of girl power through popular and well-known hits. The enthusiastic response from the audience last night proved that the cast members get their message across! 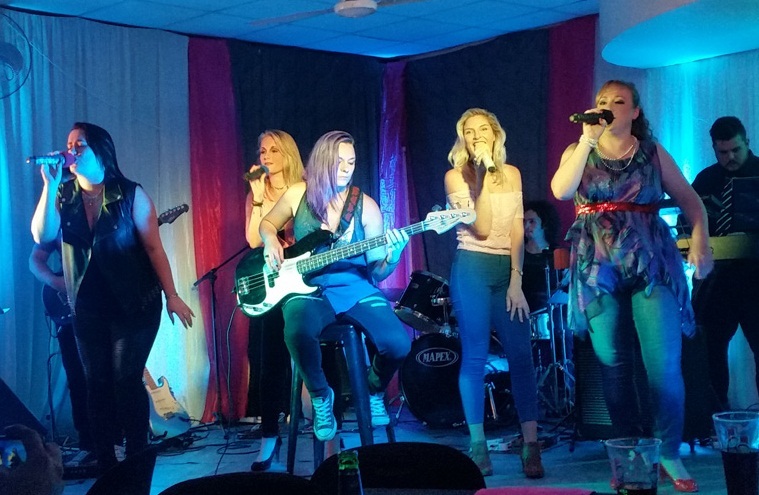 Leading the show is Caeley van Doorn who launches the evening with an energised rendition of All That Jazz accompanied by Dani Cook; Naidine Wilmot, and Alexandrea Dawson with Sharon Ditchburn providing the back-up vocals. The band features Robz Cayleigh Millar (bass and vocals); Jason Kylen (lead guitar); Tyron Van Der Walt (keyboard), and Dane Bottomley (drums). There are some fine performances, such as If You Can’t Give Me Love (Wilmot), I Want You to Want Me (Dawson), Nasty Naughty Boy (Cook); and Edge of Glory (Cook and Dawson). Ditchburn gets to sing a solo with Uninvited and Adam Fanner, dressed in drag, belted out I Will Survive. Caeley van Doorn impressed with a number of songs, particularly Proud Mary. Other excellent renditions were Hold Back the River, and the finale Roar, which was top-notch. Millar, who is fast becoming a top-notch guitarist and singer gave a beautiful rendition of Valerie and blew the audience away with an incredible bass solo in All About That Bass supported by the cast. There is impressive musical chemistry between Millar and Kylen – their guitars truly “talk” to each other. The cast wears a variety of costumes. Some work well. Some seriously don’t, with too much focus on being skin-tight where looseness would be more attractive. The show is directed by Adam Fanner and Sharon Watters with the production and technical team including Fanner; Ross Lottering; Watters and Kevin Hillier. There will be two more performances of Girl Power on April 13 and 14 at Musketeers at 7 Barham Road, Westville. Food and drink to be purchased from the venue only. Doors will open at 19h00 and the show will start at 20h00 sharp.